Four Africans, including Nigerians, who were involved in series of online fraud and swindling crimes have been arrested by the Sharkah Police. The suspects, among them a woman, allegedly offered goods online to attract victims and then duped them using fake currency. The Criminal Investigation Department (CID) had received a complaint from an Arab man, who said that an African offered to sell him a large quantity of the best quality coffee seeds at a cheap price. The complainant said he met the suspect at a mall and agreed to buy the seeds and paid a part of the amount as advance. The complainant asked the suspect to give him receipt for the payment. The suspect told the victim to accompany him to his office in a neighbouring emirate, but when they reached, he told him the office was closed and would give the receipt next day. Then the complainant asked the suspect to return his money and the latter gave him an envelope with some money, only for him to discover that the envelope contained fake currency. 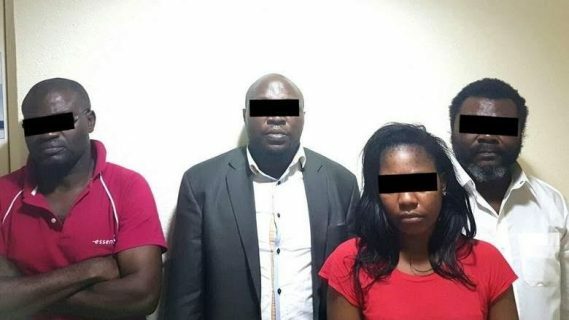 During investigation, the team found out that there are four African people promoting different kinds of goods online, including the one who cheated the victim. The suspects were located in an area in Sharjah. The police raided their apartment and recovered a large amount of stolen cash and fake currency. During the interrogation, the suspects confessed that they promoted goods online to make fake deals. They also used the fake currency for making money doubling deals.